On a brief trip to visit friends and relations in Yorkshire and Manchester last October, I began encountering an unsettling number of severed heads. Not real ones of course. 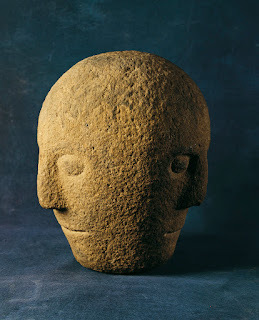 Stone heads, with an archaic, Celtic vibe. The one pictured above I've known for years, set in a wall beside my friend's house in Malhamdale. It had been found in the ruins of a chapel somewhere up on the tops and her uncle, a builder, salvaged it and built it into the wall as – well, what? Decoration? For luck? To watch over those who pass by? Perhaps all of those things? Visiting my friend again, I wondered as I’d done before, how old it might be. Medieval at least, surely - but might it be older? On the same day, heading out of the Dales for Manchester, we stopped to look into the church of St Michael the Archangel at nearby Kirkby Malham. I regard this as my church, the one whose walls I helped whitewash back in the 70’s, the one I was married in, the one where we held my father’s funeral. And looking up I noticed as if for the first time (though I must surely have seen them before) two more archaic or Celtic-looking stone heads placed between the arches. What?! The church dates back to the 12th century but it was rebuilt in about 1490. The stone heads are described as ‘Celtic’ in various accounts of the church, and they certainly look very old with their slit-like mouths, wedge-shaped noses, lentoid eyes and blank, grim expressions. But you can’t carbon-date stone, so there’s no way to know. Placed where they are, however, they must be at least as old as the 1490 reconstruction of the church. I took some photos... and that evening in Manchester, we went for a drink at the Church Inn, Prestwich, which is a characterful 17th century building set on a quiet street next door to the 17th century church of St. Mary the Virgin. Finding a seat at a quiet table I glanced casually down to my right, to see lying on its side near the fireplace yet another stone head! I was beginning to feel haunted. 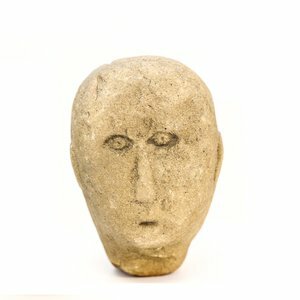 Three lots of stone heads in a single day? And this one so up close and personal? 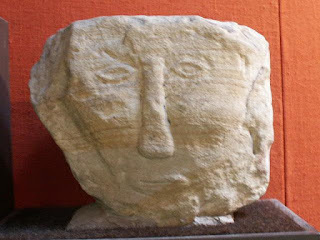 As far as I've been able to discover, most genuine Celtic stone heads are carved in the round, whereas this one, as the Malham ones must be, is carved on the end of a block of masonry that could be keyed into a wall. We asked in the bar where the head had come from and were told it had been found during an archeological dig in the beer garden adjoining the churchyard (which dates to the 12th century), and that other bits and pieces from the dig could be found in the garden. 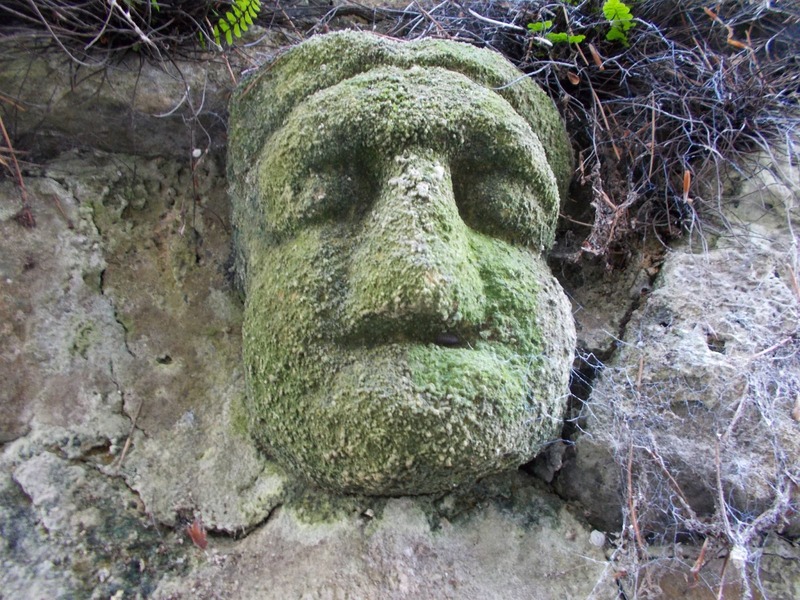 I went to look, and found a couple of medieval gargoyles and other carved stones, but nothing else that looked nearly as old and strange as this simple stone head. 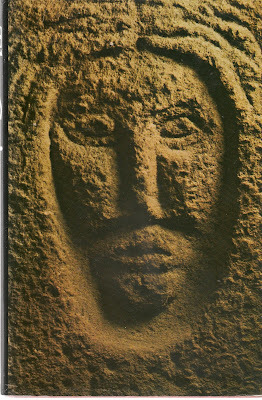 Back home I consulted a book: ‘Investigating Celtic and other Stone Heads’ (Capell Bann 1998) by John Billingsley of Bradford University. 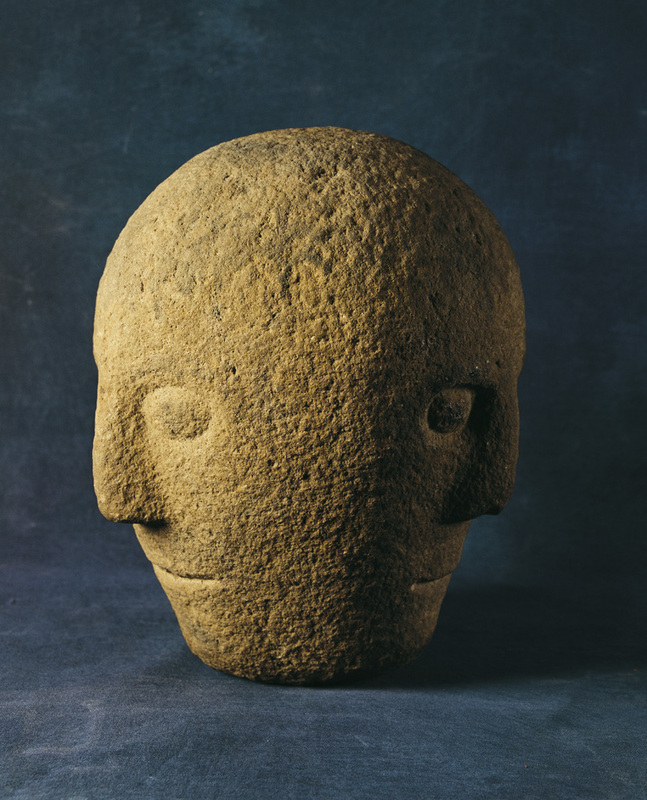 Billingley had become intrigued by the very large number of archaic-style stone heads scattered about the north and north-west of England - a survey by the Manchester Museum had clocked up over a thousand. They were found on buildings, built into drystone walls, even used as garden ornaments, but few could be safely dated. As he investigated, Billingsley unearthed evidence for what seemed to be an on-going tradition of carving archaic-style heads in stone. Some heads might, indeed, be ancient, but the majority were medieval or post-medieval; several turned out to be modern. 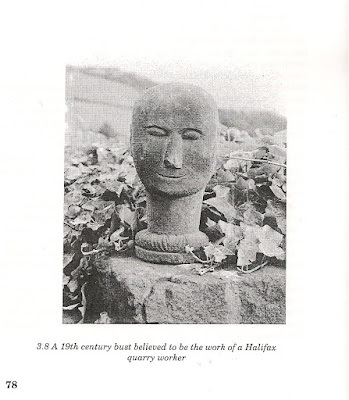 For example, the photo below, from Billingsley's book, shows a 19th century stone head 'believed to be the work of a Halifax quarry worker'. And, as is well known, the stone face at the Wizard’s Well on Alderley Edge in Cheshire was carved by Alan Garner’s stonemason great-great-grandfather Robert, with the inscription: DRINK OF THIS AND TAKE THY FILL FOR THE WATER FALLS BY THE WIZHARDS WILL. The value of a symbol is that it conveys a complex of meaning from only a minumum of information. The rudimentary and skull-like features of the archaic head – eyes, mouth, nose – relate to human faces everywhere, whether living or dead. On the other hand, classical faces narrow the range of affinity to the point where portraiture disqualifies any claim to universality and anchors the image in one time and one space. 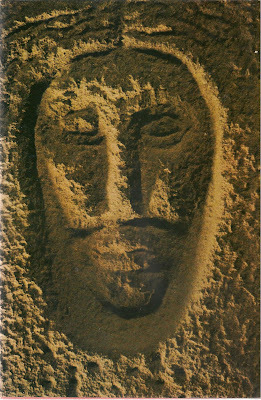 The remote yet recognisable features of the archaic head thus become the natural vehicle for a symbol relating to both human and otherworldly beings, and this is the role in which stylised faces such as the archaic head are constantly encountered. The theme of supernatural disembodied human heads may have its roots in prehistoric ritual and belief. People in Iron Age Ireland, Britain and Europe appear to have accorded the human head special reverence. Archeological evidence provides clues as to how such veneration was expressed: by carving images of heads in stone and wood; by including head-symbols on decorated Iron Age metalwork and by repeatedly depositing real human heads in special places: wells, rivers, pits and temples. The dual symbolism of the head itself and its triple face contributed to an Iron Age cosmological code in which sacred power was both expressed and enabled by this highly charged object. 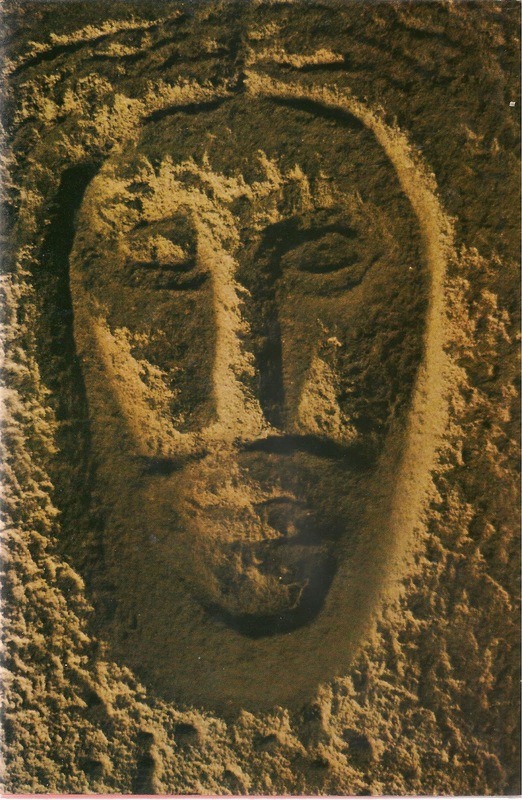 It might depict a deity but it might equally have been used almost like one of Tolkien’s palantiri or ‘seeing stones’ (used to gain knowledge of places or events far away in time or space), giving immense predictive magical potency to … those who could read it and interpret its messages. I like that idea, for the three faces see in all directions at once, just as the two-faced ‘Janus’ of Roman tradition, who gives his name to January, stares backwards into the old year and forwards into the yet-unknown new one. In legend and folklore, severed or disembodied heads are important magical objects which can speak and deliver wisdom and counsel. In the Second Branch of the Mabiogion the hero Brân, stabbed in the foot with a poisoned spear, tells his men to cut his head off. The burial of Brân’s head was one of the Three Happy Concealments, and its disinterment (by King Arthur) one of the Three Unhappy Disclosures, for while it remained under the White Mount it protected the Island of Britain from evil. There are many other talking heads: medieval literature is full of references to magicians and alchemists, like Roger Bacon, who construct oracular heads of brass or bronze which will answer questions - though usually only with ‘yes’ or ‘no’. In the 14th century poem the eponymous Green Knight picks up his head after it has been struck off by Sir Gawain, and challenges his adversary to a return match at the ‘Green Chapel’ in a year’s time. On his winter journey to keep the appointment Gawain rides through North Wales, turns up the coast with the island of Anglesey to his left, ‘fares over the fords’ by ‘Holy Head’, and passes into the ‘wild Wirral’. This is so specific that Holy Head has been identified as modern Holywell, site of St. Winifride’s Well. Winifride was a 7th century Welsh princess whose head was struck off by a prince, Caradog, whom she refused to marry. It rolled downhill and a spring of healing water burst from the ground where it halted. St Bueno restored Winifride’s head to her body and she became a nun - while the wicked suitor fell down dead. The site of this miracle is one of the oldest shrines in Wales, so Gawain might well have taken it for an encouraging sign that he should pass this scene of beheading and restoration on the way to his own encounter. 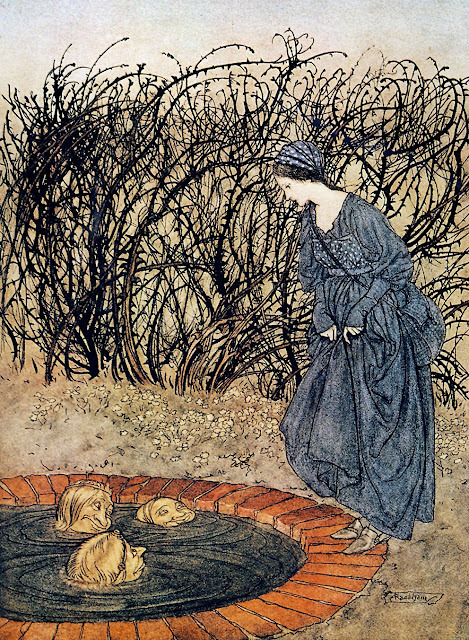 Heads are often associated with springwater and wells. 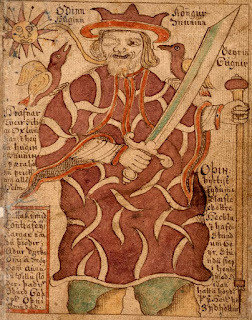 In Norse mythology the giant Mimir is guardian of the spring (or well) of wisdom that rises from under the roots of the World Tree, and every day he drinks from its waters. 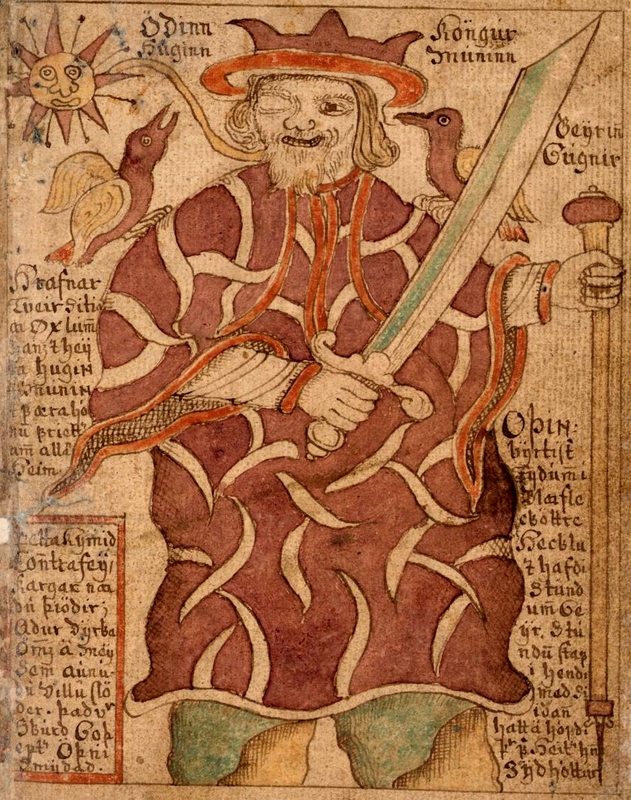 Odin once asked Mimir for a drink, but had to sacrifice an eye in payment. (Has this any significance for the few stone heads which have one eye closed as if blind?) In other tales Mimir is killed by the Vanir who cut off his head, but it is preserved at the well and Odin visits it there to ask for counsel. In all these stories the heads want attention, they want to be combed and made to look presentable, they want to be shown the sort of honour due to the dead, to the severed head of a hero. In the Grimms’ tale ‘Mother Holle’ although there are no floating heads, a girl throws herself into a well and finds Mother’s Holle’s magical otherworld at the bottom. Mother Holle was originally the goddess Holde: Jacob Grimm suggests she was a sky deity associated with the weather, who could at times like Wotan "ride on the winds, clothed in terror, and she, like the god, belongs to the ‘wütende heer’ [the furious army]." 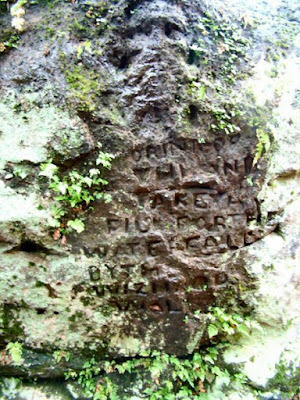 The souls of unbaptised infants were believed to join Holle’s wild company: she may have ridden through the sky, but clearly she was also a goddess of the dead, and as Mother Holle her country is underwater - at the bottom of a well. Plato, in Timaeus, states that ‘the human head is the image of the world, by which may be understood that it is the primary point of our perception of the world external to us and simultaneously, paradoxically, contains the world within it. Seldom come on the long ruled road between past and future. You stare and are silent. That is all I can see. Top photo: copyright Caroline Chappell. 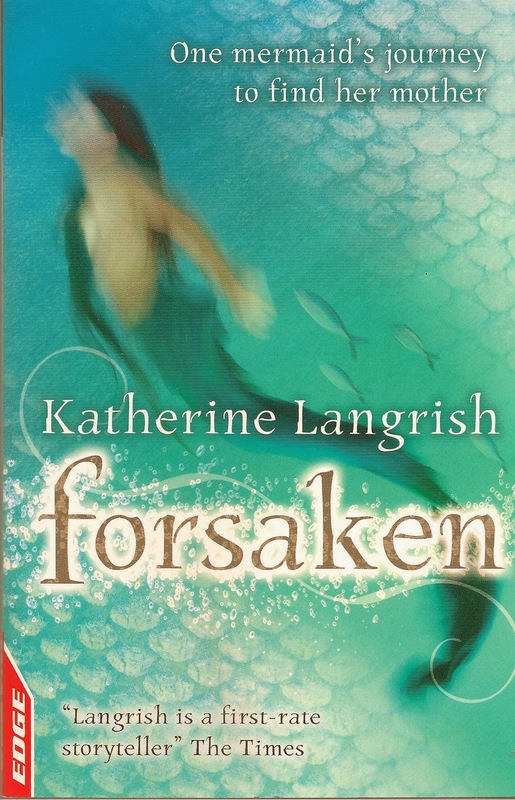 A fascinating post, Katherine! How interesting that you saw all those stone heads in the one day! I always assumed there was a headhunting thing in Celtic history, yes? Trophy heads above houses and such? I remember the first time I read that story in the Mabinogion, and felt sad for poor Bran. 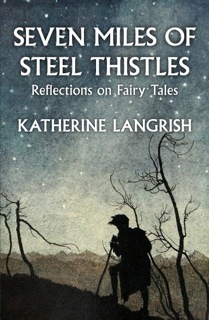 And yes, the Green Knight tale is a favourite of mine. I’ve reread it only recently, the Tolkien translation, though I also read the original at university. Yes, from what I've read it seems very likely the Celts did have a head-venerating/head-hunting thing going. Those good old days, eh!